From Matthew's matter-of-fact genealogy demonstrating Jesus' status as a descendant of King David, through the soaring words of the Sermon on the Mount, to the lessons found in the Seven Parables of the Kingdom, Matthew's Gospel is rich and wonderfully relevant to contemporary Christians. Under the wise guidance of Donald Griggs and Earl Johnson, Matthew's Gospel is also easily accessible to those with little or no knowledge of the Bible. 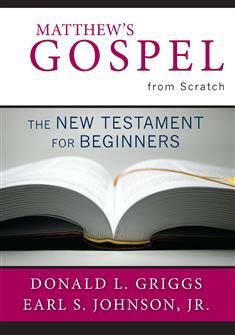 Donald L. Griggs' popular volumes The Bible from Scratch: The Old Testament for Beginners and The Bible from Scratch: The New Testament for Beginners presented basic themes, histories, personalities, and meanings of the Bible. With this expansion of the series, Griggs offers the lay reader an opportunity to build on the foundation of that broad knowledge with a series of volumes based on the individual books of the Old and New Testaments. A leader's guide and participant section are included for each book, making each volume an excellent resource for group or individual study.